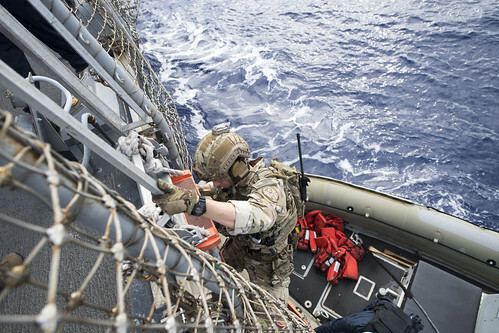 PACIFIC OCEAN - The guided-missile destroyer USS Michael Murphy (DDG 112) with embarked U.S. Coast Guard maritime law enforcement personnel began its support of Oceania Maritime Security Initiative (OMSI) Jan. 31. Through bilateral agreements, the U.S. Coast Guard assists ten Pacific Island nations in patrolling the waters around their exclusive economic zones (EEZs) Each of the nations have territorial waters stretching out 12 miles from shore. Beyond that, stretching out 200 nautical miles are EEZs, an area defined by national law that allows each nation exclusive rights to the exploration and use of maritime resources. During this OMSI patrol, maritime law enforcement officers from Tuvalu and Nauru will use Michael Murphy as a platform to intercept and board commercial fishing vessels operating in their respective EEZs. They will be assisted during these boardings by the embarked USCG LEDET and will be looking for any potential fishing violations. “The objective is to ensure long-term conservation and sustainable use of highly migratory fish stocks in the Western-Central-Pacific ocean,” said Sullivan. Michael Murphy, Tuvaluan and Nauru maritime law enforcement, and the U.S. Coast Guard will work together to conduct maritime law enforcement operations in support of U.S. and Pacific Island Nations fisheries laws and to suppress illicit activities. Upon completion of OMSI, the ship will continue operations in the Indo-Asia-Pacific region as part of the Carl Vinson Strike Group. U.S. Navy carrier strike groups have regularly patrolled the Indo-Asia-Pacific for more than 70 years and will continue to do so. Carl Vinson has deployed to the region several times, starting with a deployment to the Western Pacific in 1983, a year after commissioning. Most recently in 2015, Carl Vinson conducted port visits and exercises with regional navies in the South China Sea. 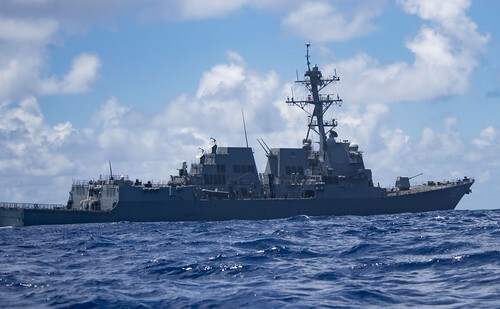 Commissioned on October 6, 2012, USS Michael Murphy is named after former U.S. Navy SEAL Lieutenant Michael P. Murphy. Murphy who was posthumously awarded the Medal of Honor for his heroic actions during Operation Red Wings in Afghanistan, June 28, 2005. Murphy was the first person to be awarded the medal for actions in Afghanistan and was the first member of the U.S. Navy to receive the award since the Vietnam War.